› Author Affiliations Funding Financial assistance by the Council of Scientific & Industrial Research (Human Resource Development Group), New Delhi, India, in the form of a Senior Research Fellowship to Ms. Shilpa Bisht is thankfully acknowledged. Sperm DNA is considered as the most vulnerable to oxidative stress-induced damage that also impairs global sperm DNA methylation leading to sperm-associated pathologies. C677T and A1298C polymorphisms of the methylene tetrahydrofolate reductase (MTHFR) gene affect MTHFR enzyme activity. 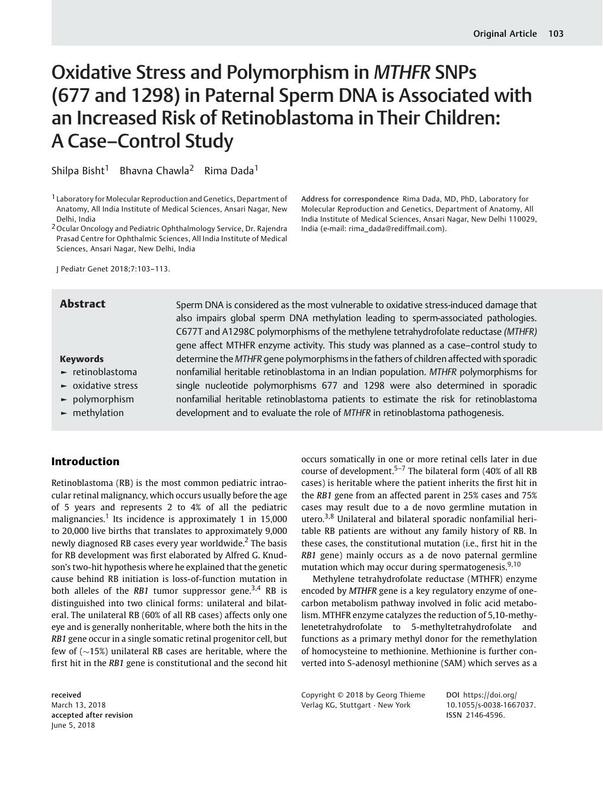 This study was planned as a case–control study to determine the MTHFR gene polymorphisms in the fathers of children affected with sporadic nonfamilial heritable retinoblastoma in an Indian population. MTHFR polymorphisms for single nucleotide polymorphisms 677 and 1298 were also determined in sporadic nonfamilial heritable retinoblastoma patients to estimate the risk for retinoblastoma development and to evaluate the role of MTHFR in retinoblastoma pathogenesis.